The UK’s Light Protected Patrol Vehicle Urgent Operational Requirement required the development of a fully composite protective crew compartment (pod) that could be integrated with the full length V-Spine chassis. General Dynamics Land Systems – Force Protection Europe turned to the skills of high tech companies in the motor racing technologies area to fulfil this requirement, one being Beagle Technology Group (BTG). 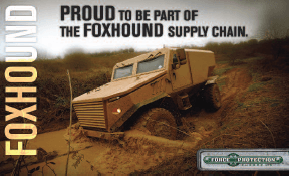 The result: the British designed Foxhound Protected Patrol Vehicle that will soon be in-service with the British Army. Meeting the demands of this UK Ministry of Defence Urgent Operational Requirement (UOR) project required Beagle Technology Group (BTG) to develop a new facility and operating practices. One of the main engineering problems for Beagle was how to automate the cutting of sizeable amounts and multiple shapes of composite material quickly, efficiently and consistently to create a repeatable and reproducible product. A pod requires thousands of separate cut pieces made from glass fibre to create the final assembly. If hand-cut, the sheer repeatability limitations and manufacturing volumes of the process would have made this an impossible task. BTG turned to Blackman & White (BW), with a heritage of 40 years of expertise in cutting solutions, to produce a machine that met their requirements on time, and within budget. The companies worked closely to create the Genesis Inkjet Hybrid Cutter, now part of BW’s composite range of heavy duty cutting machines. BTG’s production targets are very high and the Genesis is needed to run 24 hours a day, 7 days a week. Comprising a 2.5m wide table with a 5m long conveyorised bed, it is able to cut and inkjet print multiple digits using complex codes, onto larger composite panels in a single frame, doing away with the limitations of the smaller cut window offered by traditional conveyorised machines. This eliminates material misalignment, ensuring high levels of cut accuracy and speed. The heavy duty oscillating blade tooling increases the run time of the machine for efficient long term operating costs. State of the art nesting software assures nesting efficiency, processing thousands of parts and organising them into an efficient layout, minimising waste and maximising production speed. Joseph Crabtree, BTG’s Business Manager, said: â€œBeagle has been performing metal bonding for over 20 years and manufacturing composites for around 10 years for companies such as Rolls Royce and BAE.